Toulouse is one of France’s most historic and fascinating cities. Known to locals as La Ville Rose (The Pink City) after the distinctive pink stone used to construct many of its buildings, Toulouse is a cosmopolitan melting-pot that’s awash with culture, art, industry and architecture, not to mention some of the tastiest French food this side of the Côte d’Azur. Explore this compact city on foot. Toulouse city centre is small and walkable, closer in atmosphere to a country town than a big provincial capital. With its elegant squares, atmospheric old town and lively covered markets, there are few cities which feel quite as authentically French as Toulouse – it’s like a southern version of Paris only smaller, cheaper and friendlier, with fewer crowds and warmer weather. Win-win. 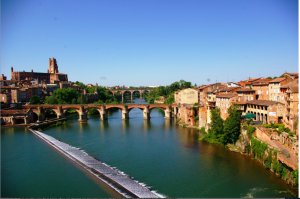 Toulouse’s greatest asset is its location on the River Garonne. The stately waterway bisects its city centre and is the heart of everyday life in the city. Flea markets and pop-up food stalls spring up along the riverfront several times a month and public parks sprawl along its banks, perfect for a picnic or an afternoon stroll. Toulouse was one of France’s most important trading cities and its merchants became fabulously rich. Their wealth can be seen in the delightful Vieux Quartier (old quarter), which centres around the fabulous place du Capitole – a vast public square covering two hectares, lined by lavish buildings including the city’s town hall and opera house. The old quarter is a photogenic tangle of winding lanes and part-medieval streets. The most distinctive buildings are the stately mansions, which were built by the city’s rich merchants and nobles during the 16th and 17th centuries. More than 50 of these grand houses still survive, such as the Hôtel d’Assézat, now home to a prestigious private art collection. Though few are open to the public, their ornate facades, decorated with stonework and sculptures, provide a visual reminder of the great wealth that once flowed through the city. The city also has several impressive churches to explore, most notably the Basilique St-Sernin, built between 1080 and 1120. One of France’s finest examples of Romanesque architecture, it is constructed from rosy-red brick and graced by an elegant spire and octagonal tower. The basilica contains the bones of St-Sernin himself and was once an important stop on the medieval era’s most important pilgrimage route. Toulouse has several atmospheric covered markets where you can soak up the city’s culinary culture. The best is Les Halles Victor Hugo, home to the city’s top food producers, many of which have been run by the same family for generations. Even if you’re not buying anything, it’s a fantastic place to experience the almost theatrical relationship France has with its food. Upstairs from the market are several bistros that serve traditional dishes. Go early as they are usually packed at lunchtime. Toulouse’s university was founded in 1229 and is now home to more than 100,000 students. Many of them are drawn here by the city’s illustrious engineering heritage: Toulouse is the centre of France’s aerospace industry, home to one of the world’s largest aeronautics manufacturers, Airbus, which has its main base just outside the city (plane junkies can even take a guided factory tour – manatour.fr/Let-s-visit-Airbus-The-shop). The city’s high-flying credentials go positively interstellar at the Cité de l’Espace (cite-espace.com), an innovative museum where the exhibits include a shuttle flight simulator and full-size replicas of the Mir Space Station and a 53m-high Ariane 5 space rocket. It’s not all about planes and interplanetary travel, though; Toulouse has an arty side too. As its name suggests, Les Abattoirs was once the city’s main slaughterhouse, but it’s been redeveloped as an impressive gallery for exhibitions of modern and contemporary art. The Musée des Augustins focuses on more classical forms of art, encompassing eras from Roman right through to the 20th century. It’s housed in a former Augustinian monastery, which is a work of art in itself. If you want to endear yourself with the locals, then make a mention of ‘Les Rouges et Noirs’ and you’ll immediately find yourself among firm friends. Officially known as Stade Toulousain (stadetoulousain.fr), the city’s rugby team is one of France’s most successful. Rugby is a religion in this corner of France and on match days the whole city covers itself with the team’s colours (red, black and white). Tickets for the games are like gold, but you can still soak up the atmosphere with a visit to its stadium, which has a museum and a good brasserie (this is France, after all).